Today I have a secret recipe for a rich and decadent dessert served at Shoney’s. 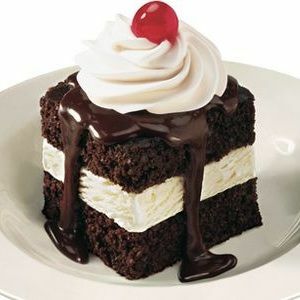 Vanilla ice cream is sandwiched between chocolate devils food cake and then topped with hot fudge, whipped cream and a cherry. This cake is great for a special occasion, or just as a treat any day. Heat the oven to 350F. Grease a 9”x13” metal cake pan. (Don’t use glass, because you want the cake to have straight sides) Line the bottom of the pan with parchment, and spray lightly. Set aside. Combine cake mix and the rest of the cake ingredients in a large bowl. With a hand mixer, mix on low speed for about 30 seconds. Scrape the bowl. Mix on medium speed for 2 minutes, scraping bowl as necessary. Pour into the prepared pan and smooth the batter. Bake for 22-25 minutes or until cake springs back when pressed lightly and the cake starts to shrink away from the sides of the pan. Remove to a rack to cool for 10 minutes. Then turn out onto a cooling rack. Peel off the parchment and let the cake cool completely. Combine all ingredients except vanilla in a heavy-bottomed saucepan. Heat on medium heat, stirring constantly until all the chocolate has melted. Stir in the vanilla after you have removed the pan from the stove. This way the vanilla will not evaporate. Keep warm (or reheat) for serving. Makes a generous 2 cups of sauce. Level the top of the cake if necessary with a knife. You want the cake pieces to have the same thickness so it looks uniform when served. Carefully slice the cake in half horizontally. Leave the halves in place. Each half should be about 3/4 inch thick. Cut the cake in half, short-wise. You will end up with 4 rectangles of cake, each about 9” x 6”. Set half the cake aside (for another use or to repeat the assembly process depending on how much hot fudge cake you want). Spread 2 long, overlapping sheets of plastic wrap on the counter. Place the bottom rectangle of cake on the wrap. Peel off the cardboard from around the ice cream. Slice the ice cream into 3/4” slices and arrange them, touching, on top of the cake layer. You will have to trim some to fit. You will probably not use all the ice cream, so put the leftover portion in a freezer container to eat later. Place the second rectangle of cake on top of the ice cream and press down lightly. Wrap the cake in the plastic wrap and freeze for at least 2 hours. Slice the Cake into 6 squares, each approximately 2” per side. Pour some of the fudge sauce over, top with whipped cream and a cherry. Pour water into a medium bowl. In another bowl, sift the flour, salt, and pepper together. Dip steaks in water, then into the flour mixture. Repeat. Lay coated steaks on wax paper and freeze for about 3 hours. Deep fry steaks in 350 degrees F oil for 8-10 minutes. Drain on paper towels. Brown ground beef in skillet. Stir in flour, then remaining ingredients. Bring to boil, then simmer until thick. Serve gravy over steaks. When i lived in Florida I would eat at Shoney’s all the time. Unfortunately, we don’t have any near us here in NY. The broccoli casserole was always so good, and now I can just prepare this dish at home! I made this last night with a roast beef dinner and it came out great. Lightly beat the eggs in a bowl for about 20 seconds. Add broccoli florets, cooked rice, salt and pepper. Mix the ingredients together until evenly combined. Dice the Velveeta into 1/4−inch pieces. Place the cheese and half−and−half in a microwave safe container. Cover and microwave for 2 minutes on medium power or until cheese is melted. Add to ingredients in the bowl and mix together. Spray 9−inch pan with cooking spray. Pour casserole mixture into pan. Place in a 350 degrees F preheated oven and bake for 30 minutes. Top the casserole with the crushed Ritz crackers and shredded cheddar cheese and cook for about 5 minutes more, or until the cheese melts and the crackers brown.